But what about the CEO of Cybage—Mr. Arun Nathani? Well, a whole deal of my present identity derives inheritance from Cybage, particularly its formative years. So as I begin this new ‘blogger’ phase of my life, it would perhaps make sense to start off with a narrative of Cybage wonder years. Now, this initial story is something you won’t see in the public domain – a glimpse of our firsts… our first breath, our first walk, and many tiny wonderful things from the big-bang years, before the dust settled and the maze cleared. Young generation need to learn lesson, from big entrepreneurs like you. It is always nice to know about the initial days of Cybage. I will be waiting for next part of Wonder Years. This blog will really help us to know our CEO better and know more abt our own company. Liked the warning :-). I think every story has a hero and some learning. It’s a great to get a BLOG like this from you. It’s not even a year I joined here, but yes I started loving this company for its work culture, the way we are being treated. I must admit that, currently Cybage is standing on strong pillars which has been laid by you and your peers 16 years back. We want you all to be there, be our guides, be our Captains of the Sailing Ship called Cybage. We are Sailing Strong….and we will be….. Cheers !! I would really like to read about your journery from an entrepreneur to a CEO. I am really looking forward to the successive posts. 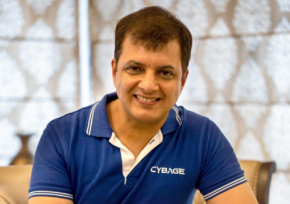 I am an ex-employee of Cybage and while i changed the work place, still i looks for happenings @Cybage (Cybage has a deep impact on my heart). Right from the starting i was deeply impressed by Arun and there was one feature on intranet “From CEO’s Desk”, it was really amazing to go through each one of the post written by him.He is an amazing writer, speaker, leader,motivator. I hope Cybage will rock in future as well. My best wishes are with you and it’s a nice initiative to connect with outer world. after reading your blog only thing comes to my mind is that you are a “real hero”. cybage is the best place to work .